A bespoke steel-framed training complex is being built for the Civil Nuclear Constabulary near Sellafield. Martin Cooper reports. Steel tonnage: 950tCharged with protecting the UK’s civil nuclear sites and materials, the Civil Nuclear Constabulary (CNC) employs more than 1,500 armed police officers and members of staff whose primary task is to deter any attack or sabotage on these important assets. To help better train its officers, a new CNC training facility is under construction near Sellafield in Cumbria, which consists of a series of inter-connected steel-framed structures. 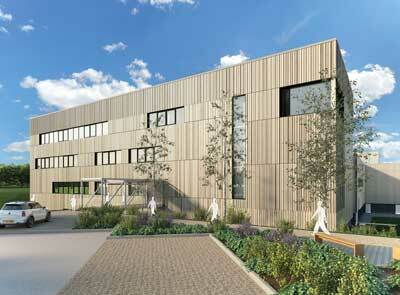 They include a three-storey hub with classrooms, operational stores, gym and offices, alongside communal use areas. Further connected steel-framed structures house two live fire training ranges – 50m and 100m long respectively, and a live fire skills area where various training scenarios can be played out within a three-storey building. The facility will be owned and developed by the Nuclear Decommissioning Authority (NDA) and leased to the CNC. Morgan Sindall has been appointed to construct the facility with Deloitte Real Estate providing project management and cost consultancy support. Commenting on the project that began last May, CNC Assistant Chief Constable Chris Armitt, says: “The new training facilities represent an important and necessary step forward for the CNC, ensuring we continue to effectively deliver our mission of maintaining public safety and protecting civil nuclear sites. Work on the project started in May 2016 with the previously greenfield site, which is adjacent to the main Sellafield nuclear plant, undergoing a cut and fill operation. This work was undertaken to form a level footprint for the buildings on the sloping site. Once the pad foundations were installed, the steelwork erection progamme kicked off in July, with all of the main structures erected by November. “A steel-framed solution was chosen because of the long spans required for the ranges, while cost and speed of construction also played a big part in the decision,” says Morgan Sindall Project Director Paul Limb. 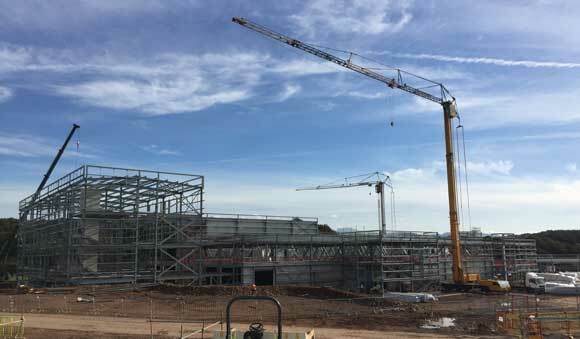 “Configuring the steel frames so they best fitted the site, especially as one of the ranges is 100m-long, was one of our initial challenges,” says WML Project Engineer Emma Hackney. The biggest building is the hub that will accommodate the main entrance and it sits at the western portion of the site. Behind this structure are the two steel frames housing the ranges, sitting either side of the live fire skills zone. At the end of 50m-long range and the live fire zone, two smaller connected frames house soft skills, which means training without live ammunition. Beyond these structures there are two further small, and completely independent, steel structures accommodating a workshop and a store. As well as fabricating, supplying and erecting the project’s structural steelwork, Border Steelwork Structures (BSS) has a large remit on this project as it also installed precast floor planks, windows, cladding and roofing louvres. 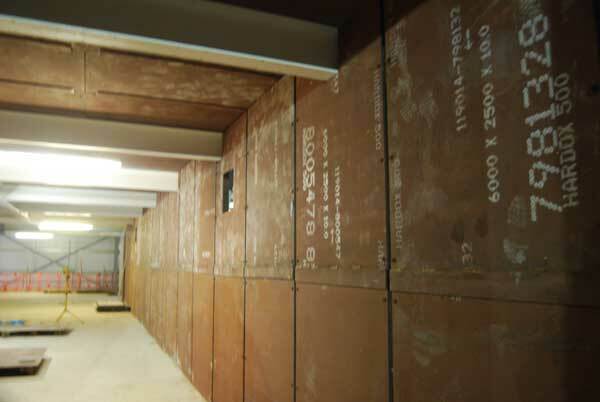 “We had to sequence our programme to allow access for our floor installation which had to follow on behind the steel erection,” explains BSS Senior Contracts Manager Stuart Airey. The sequencing meant the two parallel ranges were erected first, followed by the connected three-storey hub building. Finally, BSS erected the live fire skills area which sits between the ranges. This area contains precast flooring units and in order to gain access for the crane it had to be built last,” adds Mr Airey. For its entire programme, BSS used four 80t-capacity mobile cranes for the steel and flooring programmes, and two self-erecting tower cranes for cladding and roof installation. Erecting the two ranges required BSS to assemble on site a series of 24m-long trusses that form the two column-free spaces. These were brought to site in two sections that were then spliced together and lifted into place as one large piece. Supported on perimeter columns set at 7m spacings the trusses, which have a maximum depth of 4.5m, taper to form the sloping profile of the roofs. The two ranges are independent structures that gain their stability from bracing positioned within their perimeter walls. The live fire skills area gains its stability from the ranges on either side. 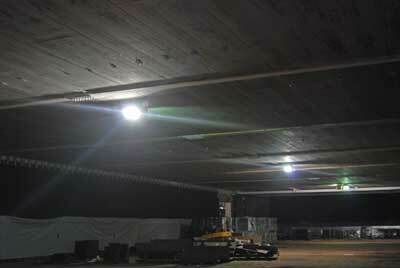 A series of 14m-long Westok cellular beams, supporting precast planks, form the live fire skills areas floors. Structurally the ranges are separated from the hub building by a double column movement joint. The hub is a braced frame with cross bracing located in perimeter walls. One row of internal columns creates two internal spans measuring 7.5m-wide. A steel bridge connects the hub building’s main entrance at first floor level directly to a car park. Construction and fit-out is due to be completed by the end of the year and the facility will be operational by January 2018. “This is a bespoke building as it is the only one of its kind in the UK to have all of the training facilities within one large building,” says Morgan Sindall Project Director Paul Limb. As the name suggests, live ammunition will be fired in the live fire skills area as well as within the two ranges. Consequently, these areas have some special cladding to prevent bullets from leaving each of the three isolated zones, and to prevent dangerous ricochets. The steel frames support concrete wall panels that have a series of hardened bullet-proof steel (also known as ballistic steel) plates bolted to them. Timber batons placed onto the plates then support a further layer of rubber matting that creates a 500mm void. Bullets penetrating the rubber will hit the steel plates and then drop down through the void into collecting trays placed on the floor.